Overheard: Bourdain on Disappearing Manhattan -- He's Serious. I don't normally like to spread hearsay, but I overheard a fascinating Anthony Bourdain No Reservations tidbit this morning on my Russ and Daughters run. And I think it deserves its own post. I was at Russ's, ordering my tofu cream cheese, fresh OJ, salmon(for my husband) and bialy's when I heard the topic of the No Reservations episode featuring Disappearing Manhattan come up. If you saw the show, you know that Russ and Daughters on Ludlow street, LES NYC, was featured prominently on the episode. "We were just glad that he liked what we had to say!" One of the Russ counter slicers responded. "He is serious." So, good to hear, it sounds like Tony really went into his Disappearing Manhattan show with a serious face and serious attitude. He means business. He was no Rachel Ray or Samantha Brown with a wide smiling face thanking everyone and commenting how wonderful everything is. If he didn't like what he saw, I don't think it would make the cut on the show. Of course, Russ and Daughters, a NYC icon since 1914 made the show and shined as a true throwback-to-classic-NYC gem that it is. The Russ guys really seemed to appreciate Tony's sincerity and seriousness. Tony came to Russ's for a street level experience. He was not there to flaunt his celebrity card. He was there to taste the salmon and get some helpful facts for his fans. You may have heard Tony refer to the 'new' Times Square as a sort of gritty tourist-trap Disneyland. He misses the seedy stripper joints and feeling of unrest. OK, I agree. But at least Broadway theater still thrives with a true NYC spirit in Times Square. The feeling of 'theme park' is indeed a bit of a thorn in a new yorkers side. But that's why most NYC residents avoid Times Square if at all possible. 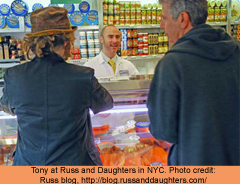 In the Disappearing Manhattan episode, Tony also visited Katz's Deli, also on Ludlow street, just a few blocks from Russ. Katz's has been around since 1888. Talk about a survival story. Tony seemed to take care in the fact that both Russ and Katz's are landmarks in NYC and if they ever closed down a piece of the heart of the city would be forever lost. I agree Tony, I so agree. Read more about the Manhattan show of No Reservations here in Tony's Blog titled Not Fade Away.